Oops. This week got away from me so I'm just going to let you jump right in to the recipe swap. 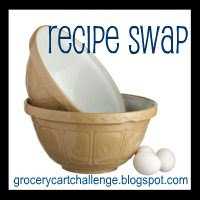 If you have a recipe you'd like to share please link directly to your post, not your homepage, and please include a link back to The Grocery Cart Challenge from your post. Feel free to grab the button at the top if you'd like.